To remove tree stumps and major roots we have modern stump grinding machines which can remove any size of stump from both residential and commercial premises, including gardens, estates, park lands and golf courses. How are the stumps removed and what happens to the debris? We use a stump grinding machine which basically chews up the tree or shrub stump leaving just a pile of woodchip material which is left on site and can be re-used as mulch in your garden. How far do we go down? We grind down to approximately 8 inches below ground level unless it is impractical or dangerous to do so. We take health and safety seriously and always carry out a risk assessment before each job. Do we remove all the roots too? No, we don’t remove all the underground roots but we can remove any of the main surface roots. Can we reinstate the ground? Yes, we can provide a quote to reinstate the ground to whatever condition you require after the stump has been removed. What access do we require? 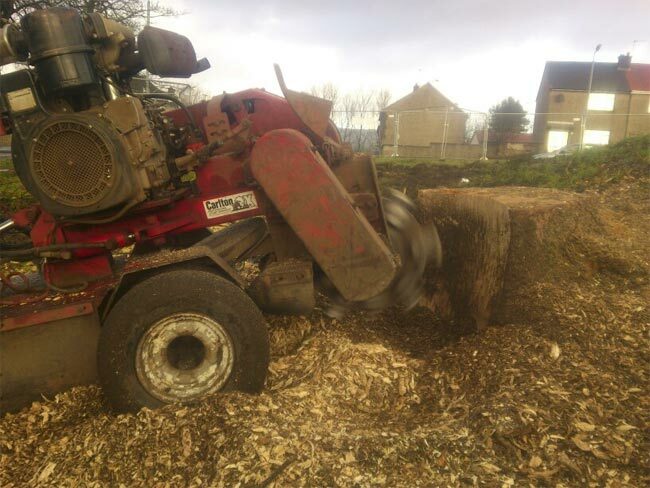 Due to the range of our machinery we can access almost any stump. For stumps greater than 2-3ft in diameter we generally require only a 3ft access to site. We operate a handheld machine allowing us to access via stairs, through doorways, gates and into confined spaces. What about underground services that may be affected? Most services should be below the 8 inches we grind down to and we take every precaution including the use of Cable Avoidance Equipment to ensure safe operation. As part of our risk assessment we will ask you, the client to inform us of any known underground services. Please see our terms and conditions for more details.